Whether on a new career path or your first job, beginnings are exciting. You are filled with hope and confidence that you will make an impact. Until that is, you don’t. Fear sets us back from unleashing our true potential, but how do you know what barriers are standing in your way? Take our "fear of" quiz now to find out! Maybe the job wasn’t what you thought, or the company wasn’t the right fit. Perhaps the industry is the wrong one for your talents, or maybe it’s you. Searching for the answer to why it didn’t work out can be difficult. It’s hard to shine a light on the things that hold you back. The harshness of recognizing your weaknesses and drawbacks sucker punch you, sometimes to the point of feeling like you want to give up. But you don’t. Why? Because deep down you realize you can make that impact if you figure out what’s sabotaging your progress. At least that’s how it’s worked for me. When it came time to launch my career, I was confident in my abilities. Yet from time to time, things seemed to derail. I would blame outwardly until I realized – the one constant is me. Why was I holding myself back? Simple. Fear. There are these internal dialogs in your head that keep you from being as successful as you desire. I’m not good enough. It’s too hard. What if I fail? It’s frustrating, but it’s an important first step to recognize that they are there. Once you acknowledge that, what do you do? If only you knew exactly what fear is holding you back! For me, it was understanding how fear works and then figuring out my fears, that allowed me to fulfill my passion. Not an easy path, but completely worth it. The first question to ask yourself is ‘do you really know what those deep-seated adult fears are’ (and trust me there is probably more than one)? After all, an obvious fear of snakes or spiders is probably not keeping you from getting promoted. Fear of failure, or self-worth? Now those will definitely impact your career trajectory and are not so easy to see. How Do You Know It’s Fear? there are signs that fear is holding you back. Are any of these familiar? You only see the downside. Inability to think things through. Avoiding anything new or unknown. If you are truthful, then you will recognize that you feel some, if not all of these, from time to time. Occasionally, it might be normal, but when it becomes a pattern, particularly one that holds you back, it’s time to GET REAL. When you first start to address fears, it is common to begin with those that are obvious. However, there are deeper fears that when uncovered, allow for impactful change. Finding your fears is the first step. But how do you move forward? I’m blessed to have people in my life who support me in breaking through my fears and overcoming barriers. From family to friends, to mentors, to coaches, I have a network of smart people who help me recognize the truth. While sometimes hard to hear, having knowledgeable counsel who will provide the truth, even if it hurts, will support you in moving forward quickly. Part of the process of getting past fears is to have the tools to overcome them. This is a process, and one that can be fast or slow depending on the individual. It’s your choice. You just need to utilize the tools to overcome fear so you can move your career to the next level. Succeed On Purpose was built for exactly that. I know because I’m fortunate to have participated in many of the programs. 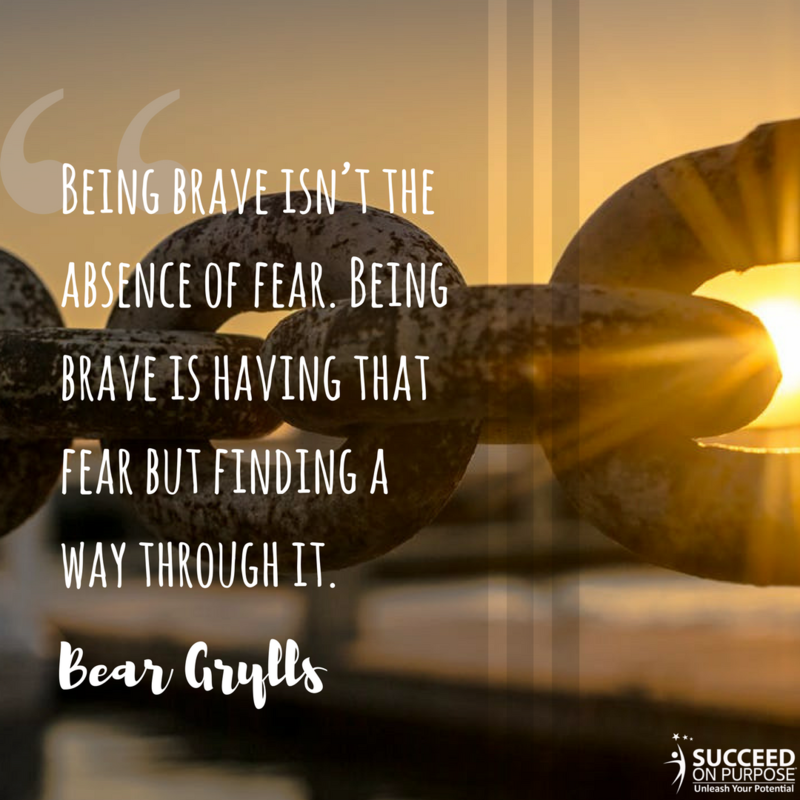 It’s having the framework to address your fears, figuring out what the barriers are that are holding you back, then overcoming them that puts your career, and your life, in overdrive. If you want to HAVE MORE, then now is the time to GET REAL and face your fears. Here is a great quiz to help you get started. From there, you can find the tools and techniques to overcome your fears, become your true, authentic self, and have more. Let’s do this!